(left and right sides). A bulls-eye (circle) has 4. When the wall is core filled, the membrane (flashing) around the arch line stops the concrete. Remove off-cuts and extra blocks to reveal the arch. Cut all the blocks before construction. 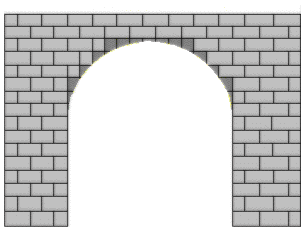 The cut blocks (all halves) that form the arch are numbered sequentially, with off-cuts numbered identically. Take the opening to spring height, then using a standard horizontal head support, go across the head, laying each cut in its place, its matching off-cut on top, with a membrane (aluminium flashing is ideal) between the two. Lay the cut, place the flashing on top of the cut line and lay the off-cut to lock membrane in place. Use overlapping lengths of thick, strong aluminium flashing about 1 metre long so the flashing doesn't get in your way. You can combine this Templateless Arch System with the Circular Wall System to easily build curved or circular (and raking) walls with arches or bulls-eyes. It's easy! If you'd like more detailed info on this, please contact us.